Big domain name purchase is starting to pay off for VPN.com owner. 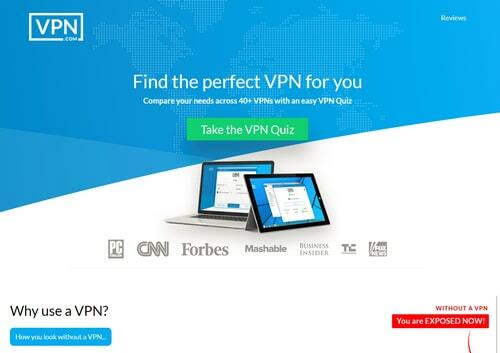 VPN.com was purchased for close to $1 million this year. Many entrepreneurs have a story of chasing down their dream domain name, but few fought as long as Michael Gargiulo. After four years of trying, Michael Gargiulo successfully acquired the domain name VPN.com from its original registrant in January 2017. Gargiulo had his sights on VPN.com since he got traction on his anonymous browsing service ProxyServer.com. The service has been used by over five million people. And while that’s a successful service, Gargiulo believes he can be even more successful with VPN.com. It took years of trying to finally secure it. During the time between when Gargiulo first inquired about buying the domain to closing the deal, talk of VPNs exploded as internet security and privacy became part of the daily conversation. Searches for VPN on Google increased 10x during that time. Gargiulo’s company paid close to seven figures for the domain name with the bulk of it up front in cash. He can’t disclose the specific terms until the middle of 2018. The domain name provided instantaneous value, but in a somewhat different way than Gargiulo expected. The domain gets hundreds (and sometimes thousands) of type-in visitors per day, but Gargiulo said becoming the number one search result in Google for VPN is the ultimate goal. VPN.com currently offers an in-house VPN, but Gargiulo is shifting the focus in the next couple of months. Competition in the space is fierce, and it will take millions of dollars of technology investment to compete. So VPN.com will become more of a comparison site for VPN services, similar to what Hotels.com is for hotel rooms. DNW will check back in with Gargiulo when he can reveal the full details of the transaction next year. I always thought encrypt.com could be a good brand for a VPN service but VPN.com was a terrible competitor, now it is in use my chance for a big sale is bigger. Encrypt.com is a great domain name. It can’t hurt to have LetsEncrypt.com out there, too. Encrypt.com is great.. in fact we thought about it before buying VPN.com. The problem was “Encrypt” only gets 165k monthly searches whereas “VPN” gets 13M.. that kind of swayed us. Good luck with a sale.. the market has really opened up for these types of domains. Any interest in purchasing our domain profile.com?